So much of sunshine has made Agadir, Morocco, the country’s number one tourist destination. The pristine beaches and the sun is the perfect combination for every tourist from colder countries across the globe. Let us go on a tour of the city. Agadir is considered the regional capital of Morocco and lies to the south of the Atlas Mountains. It is the shortened version of the Berber word “Agadir n Irir” which means, the fortified granary. It is a favorite with holidaymakers due to modern construction and the open spaces. The beaches are serene and favorable for water sports. There are several resorts where you may have leisurely accommodation and experience the superb hospitality of the Moroccans. The origin of this name is not entirely known. Agadir GeschiedenisHowever there may be some link to a fort built by a Portuguese merchant north of town in the year 1505. It was later owned by King Manuel I of Portugal, who changed it into a garrison city. It was the time when the Agadir port was a major port on the sea towards Sudan and Guinea. In 1541 it was captured by the Irish Saad. However, in the 17th Century it was under the control of Berber Kingdom of Souss and later was conquered by Moulay Ismail which was the golden era of Agadir. Sisi Abdellah Mohammed closed the port and founded the new Essouira, which saw its glory weaning. In 1911 the Agadir Crisis between France and Germany led to France bringing a protectorate over Morocco. The worst moments of the city were the 15 seconds on the midnight of February 29, 1960 when an earthquake destroyed the whole city killing thousands. It destroyed the entire ancient Kasbah. However the destruction was taken as a challenge by King Mohammed V of Morocco to rebuild the city. Agadir was rebuilt 3 kms south of the original site. Agadir is a fine modern city now with wide avenues, blooming gardens, superb hotels, first grade airport and a magnificent port. Other than this the first attraction for the tourists are the splendid beaches lined with lively resorts. The beaches are the most popular with the town lacking typical tourist attraction like museums, ancient monuments etc. However, you can have a great stay at one of the hotels in town and take day trips to some interesting sites nearby. You would find the cliff road that flanks the old Kashbah of the 16th century and overlooking the pristine blue waters of the oceans very interesting. The colorful valleys of the Great Souss and the slopes of the majestic Anti-Atlas are a must visit. The kingdom of Morocco is blessed with bright sunshine for about 300 days of the year. Adagir beaches are the perfect location to catch some sun, go sailing, wind surfing, horse riding or simply lounge in the shade of the Eucalyptus around here. There is nothing as refreshing as watching the beautiful blue waters of the ocean, sipping a fresh fruit cocktail with the mild smell of the Eucalyptus. Kasbah: The Kasbah was built in 1540 by the Saadians to protect the city against the Portuguese. The ocean looks splendid from an height of 240m cliff overlooking the city and the port. Valley of Birds: It is a zoo located in the heart of the city with a number of birds from around the world. Suk (market): This is the famous open-air market to the southeast of the city. 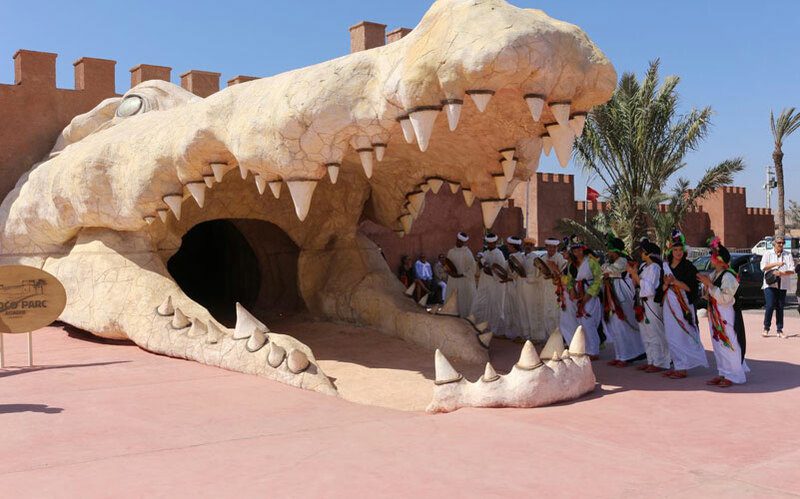 It is huge and spread over 6 hectares selling interesting merchandise and specializing in spices. Folk Art Musuem: This museum was built in 1992 and you can catch some interesting and colorful folk arts and traditions of the Souss Valley here. You can also visit the restaurants around here that serve traditional Moroccan cuisine though there are not many discos, clubs and bars. Agadir is the best location to head to during winter with a mild climate and hitting the beaches to catch the soft winter sun. 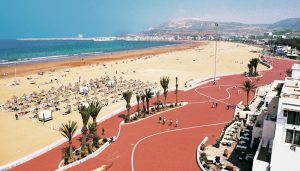 The population of Agadir (678,596 approximately) is known for the hospitality and care and you would surely find yourselves wanting to come back to enjoy the city.